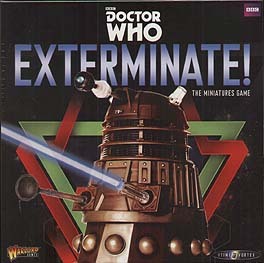 Two of the Doctor's most ancient and relentless foes - the hateful Daleks and emotionless Cybermen - clash as they seek to fulfil their own nefarious ends in this fast-paced tabletop miniatures game. Amongst the titanic conflict, the Doctor protects the Time Vortex the only way he knows how - with ever-changing companions, the TARDIS, and a sonic device. Take control of either the Daleks or the Cybermen. Pit your wits against your adversaries as you attempt to gather resources vital to your plans before they fall into the hands of your opponents. Build your force from a variety of options and recruit other factions to your cause - whatever it takes to ensure you have the advantage over your foes!